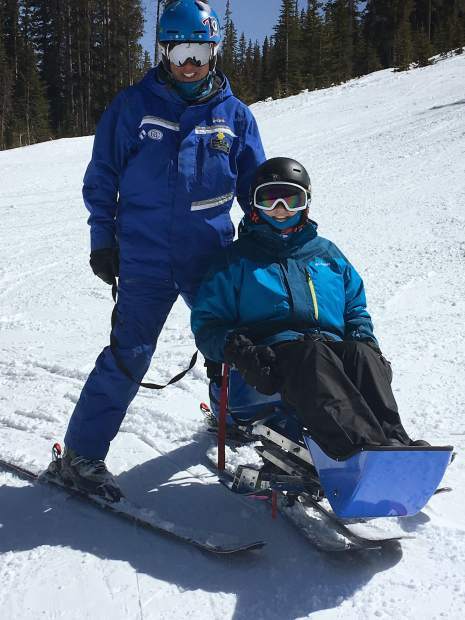 A total of 28 young cancer patients, ages 12 to 18, participated in one-on-one skiing instruction, among other activities, during the Sunshine Kids Winter Games in Beaver Creek this week. BEAVER CREEK — Young cancer patients from hospitals across North America attended the Sunshine Kids Winter Games from Sunday, April 1, through Saturday, April 7, in Beaver Creek. A total of 28 children, ages 12 to 18, participated in one-on-one skiing instruction, snowmobiling, ice skating and shopping in Beaver Creek Village, culminating in a downhill ski race to end the week. The child participants, medical volunteers and Foundation staff were guests at Park Hyatt Beaver Creek during the week. This trip was made possible through the support of Berkshire Hathaway HomeServices Colorado Properties, Beaver Creek Adaptive Program, Park Hyatt Beaver Creek and local merchants. This event is provided free of charge for the children by The Sunshine Kids Foundation, a national, nonprofit organization dedicated to providing positive group activities for children with cancer. The Foundation also provides national events in New Orleans, Washington, D.C.; the Texas Hill Country; New York City; Chicago; Los Angeles; Orlando, Florida; and Hawaii. Visit http://www.sunshinekids.org to learn more about the Foundation and the children it serves.